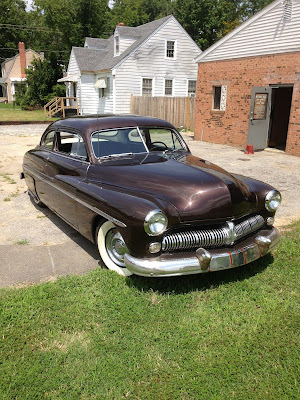 1950 Mercury for sale call Doug 804-264-1953 It is an older restoration that I bought about five years ago. I have since driven it all over the east coast, the deep south and occasionally up north. 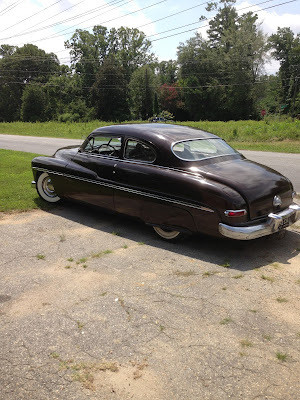 I have worked out the ghosts that tend to haunt these old cars and now it is time for a new home. I have thoroughly enjoyed building and driving the car, but other projects have come my way. The front and rear suspension has been lowered with new spring all of the way around. New front shocks were installed a few months ago and bushings/seals were installed all of the way around about two years ago. The brake pads are relatively new along with the wheel seals and bearings. The front tires are less than a month old and the rear tires are about two years old. 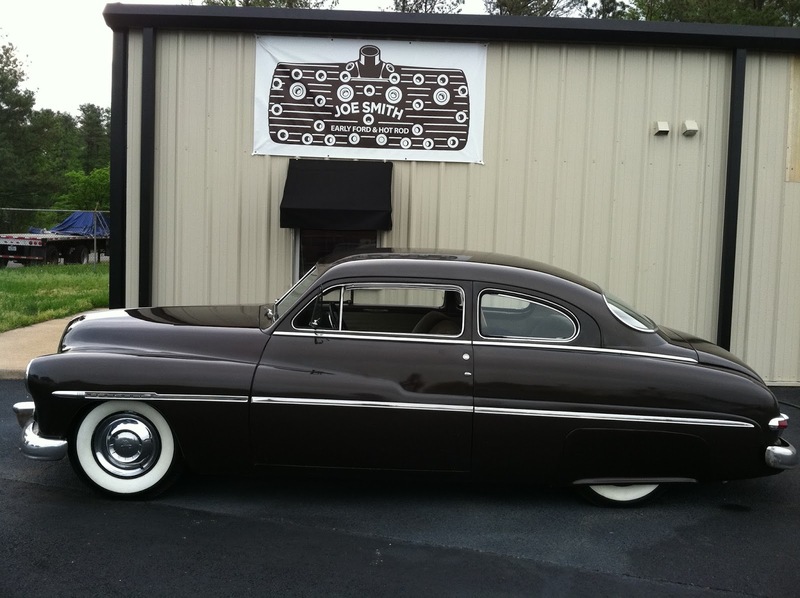 This car was originally a three speed car that has been converted to a three speed with overdrive. The rear end was rebuilt about three years ago and has 4:27 gears to match the factory Overdrive trans which was rebuilt this winter. Two new u-joints were installed and the driveshaft balanced at that time. I do not have the wiring hooked up for the transmission at this point so it will not shift into overdrive. The engine was rebuilt in 2010 and has seen many reliable miles of use. The crank was offset ground to 4 1/8" stroke the engine was bored 1/8" (.125) over for a displacement of 284. The block has been relieved and the heads have been reworked to un-shroud the larger intake valves. The lifters are adjustable and the cam is an Isky Max1. There is a 500 cfm Edelbrock 4bbl sitting on top of a heavily worked Edelbrock intake to match the heavily worked Edelbrock heads. The aluminum timing cover has the extra support for the distributor. The flywheel has been lightened and balanced with the correct Mercury pressure plate. All components have been modified to work together and put the power where most of us do the driving. 1500-2500 rpm. Dual exhaust was installed about 2 1/2 years ago. the fuel tank has been replaced with an alloy unit along with the sending unit. All gauges work and display accurately. New water pumps were installed along with 160 degree thermostats, thermostat housings and hoses. New water temp sending units were also installed at that time.The radiator has been cleaned, pressure tested and sealed. I am running a 4lbs radiator cap and water wetter. During the heat of the summer the temp gauge will drift up when stopped for long periods of time. It has never overheated. As mentioned all of the gauges work, including the clock. The battery, the starter, the regulator and the generator have all been rebuilt or replaced within the last two years. The entire wiring harness has been replaced with cloth over plastic factory replica wiring. This still the factory 6 volt positive ground. There is a rust hole the size of your thumb in the drive's side floor board that has been covered with metal that was riveted to the floor. I did not do it and I did not explore further. The trunk is solid along with the rockers, fenders and frame. All of the usual places that rust through on these old mercs have been check and minimal surface rust has been found. The Paint and interior are in good to fair condition. It has been repainted and this brown is not a factory color, nor is the interior tan. There are paint chips and scratches. The usual wear and tear of a driven car can be seen on both the paint and interior. What you would expect to see from an older restoration. The door handles ave been shaved along with the hood. There is zero rust in the hood as it has been replaced. The 51 skirts were painted at the same time. see pics. Electrical, fuel, suspension, brakes, engine, trans, rear all rebuilt or replaced in the last 5 years. I take my wife and kids with me on trips. Did I mention the seat belts? Some trips have been long and some have been short. And it has been a lot of fun. This car has never offered me any trouble that couldn't be fixed on the side of the road with simple hand tools and some ingenuity. (points closed in GA, "vapor lock" in NC, bad regulator in TN, and a few things around town).